Do you remember reciting that prayer as a child? I came across it while preparing to write this blog entry and it rang a bell, although muffled by the passage of thirty years. 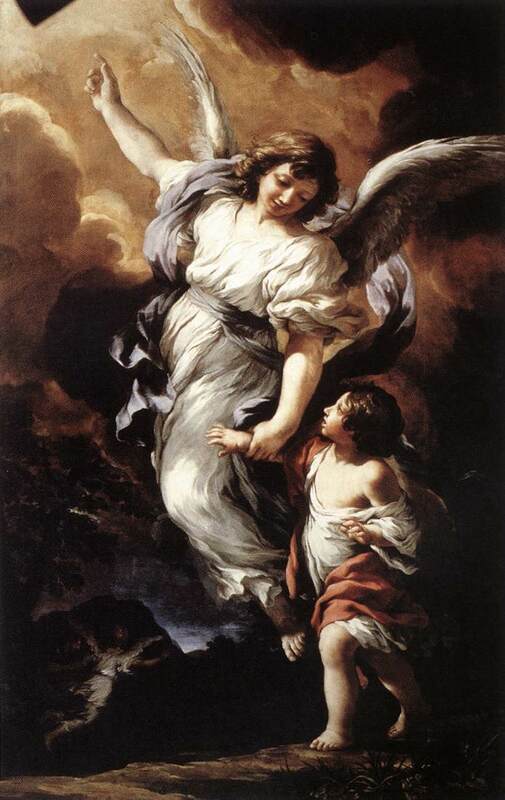 Guardian angels are, if the above images are any indication, the child-minders of the angelic hierarchy. You see them watching over adorable children who are about to hurt themselves or get into some kind of trouble. Some are male, some are female, but all have a beatific haloed aspect and an unmistakably loving expression. The three artwork examples I've chosen do not begin to describe the variety of themes, moods, and interpretations available by Google Image Search. The more results you scroll through, the more apparent it will be how post-Christian secular culture has digested this concept in movies, music, television, novels, comic books, animation, and video games. In Matthew 18:10 Jesus says, “See that you do not despise one of these little ones [children]. For I tell you [crowd of adults] that in heaven their angels always see the face of my Father who is in heaven." These are no mere child-minders, then, if they report directly to the Throne! Up and down Jacob's Ladder they must go, just as Jacob himself observed in his dream at the place he would call Beth'el upon waking. 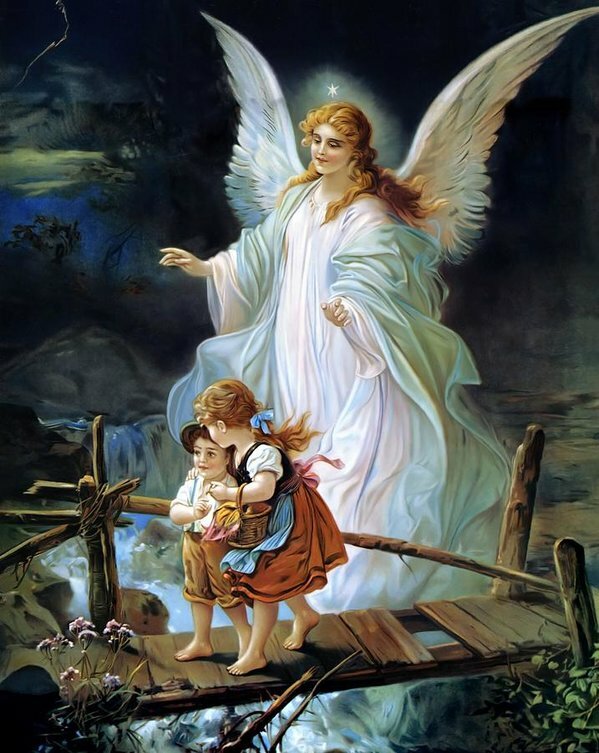 The Guardian Angel Prayer [above] was written for children. In the old paintings and prayer cards, they are associated with children. I think there are two main reasons for this: The first being how very endearing we find such images (the obvious reason) and the second being the child's passage into the age of responsibility, conscience, and reason. When he or she is capable of understanding the difference between right and wrong, good and evil, their angelic guardians must respect this by adopting a more hands-off approach, so to speak. They must shrink in stature and remain dutifully at the believer's right shoulder. They must do this to accommodate the little devil on the believer's left shoulder. In The Tragical History of Doctor Faustus (1604) by Christopher Marlowe, the title character is depicted as having two ministering spirits at his right and left side. In Islamic literature, these spirits have names. "Raqib" sits on the person's right shoulder to passively record his/her good deeds while "Atid" sits on the person's left shoulder to passively record his/her evil deeds. 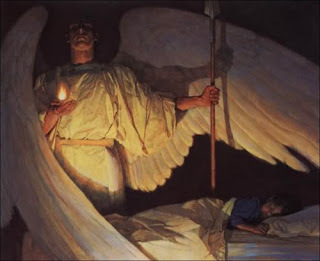 What place does the Guardian Angel Prayer have in the lives of 21st century people, if any? What excuse do we have in the age of iPhones and space travel and the Large Hadron Collider for harbouring such pre-scientific ideas? For cryin' out loud, the Internet has made knowledge more widely accessible than ever before! Combined with the image of a child reciting this prayer with Mom or Dad at bedtime in the glow of a night-light, and you've got a Norman Rockwell tableau to tug at your heartstrings. You have a child that knows he is loved, wanted, honoured, cherished, protected. Even if he doesn't understand the Bible stories Mom & Dad read to him at night, he knows in his child's heart what it means to dwell in the shadow of the Almighty. A child young enough to need the bedroom door left open before his parents leave the room so that light from the hallway can shine in is fact the greatest in the kingdom of heaven. When we were children, we talked like children, thought like children, reasoned like children. 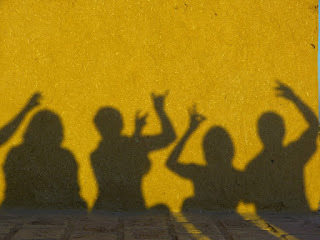 When we became adults, we put the ways of children behind us. Despite all that we had learned of the world over the course of our lives, we still remembered that we were little children. The Kirama Kaitibeen / "Honourable Scribes"
Another take on a child depicted with her guardian angel is...we are all God's children no matter our age. We need that angelic guidance and support throughout our life. We are never alone. Yes! Being a child in the eyes of God has to do with how we our relationship to Him and how we see ourselves in relation to Him. What does it really mean to put aside childish things, then? What things are childish in the eyes of God? If God cherishes the heart of a child, how should we see the process of growing up? Is it a good thing?